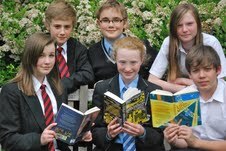 Three local schools came together on Wednesday 13th June to announce the winner of the first Alcester School’s Book Award. Alcester Grammar–Academy hosted the final event and announced that the winners were The London Eye Mystery, by the late Siobhan Dowd; Ribblestrop by Andy Mulligan and The Fool’s Girl by Celia Rees. Andy McIsaac and Emily Brealey from Alcester Grammar School. Daniel Bishop-Jennings and Rebekah White from Alcester Academy and Elise Carpenter and Connor Wilby from St Benedict’s.